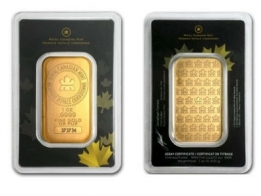 Buy the Royal Canadian Mint Maple Leaf gold bars in 1 Ounce size. Suisse Gold sell RCM gold bars in sizes ranging from 1 ounce to 1 kilogram. The 1 ounce RCM Maple leaf bar is very popular with gold investors due to the low premium on the bar. RCM gold bars are available for worldwide delivery or for storage in our vaults.